The intensity and the extent of popular anger against the tyranny and incompetency of Hosni Mubarak regime in Egypt have undoubtedly taken the whole world by surprise. The U.S. government has been sending mixed messages to its close ally and its angry population alike. With rhetoric swinging between realism and idealism, the Obama administration has expressed willingness to help the regime implement necessary reforms, urged all parties to refrain from violence, and acknowledged the “universal” rights of the people. The real story is that the United States and the European Union are keen to see social, economic, and political reforms initiated by the existing regime, and, given the circumstances, this is the right policy to be pursued. In other words, Hosni Mubarak’s ability to retain his power until the September’s Presidential elections offers the best prospect for instillation of democracy and preservation of stability in Egypt. Unsurprisingly, now that the status-quo is shaking, there have been countless expressions of amazement that the U.S. government made its bed with such a dictatorial regime for so long. The Obama administration has been criticized for its lack of support for pro-democracy advocates and failure to uphold the principles of American exceptionalism; namely, respect for human rights and promotion of democratic norms and values. 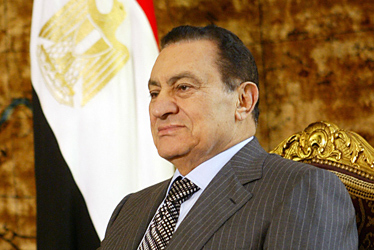 Some have gone even further arguing that America ought to utilize its leverage to force Mubarak to stand down. Sadly, such views are at best inconsistent with realities on the ground and at worst naïve. The stakes are sky high and that Western preference for an “orderly transition” to democracy should not be hard to understand. First of all, Mubarak’s regime, in spite of all the passion on the street, could survive and would remember well any wavering of U.S. support. Mubarak’s NDP is the most powerful force in Egypt thanks to its composition which is a coalition of business and political elites who have a vested interest to preserve the status-quo. In addition, the military is highly likely to remain loyal to the President because it has been enjoying an unprecedented fiscal autonomy under Mubarak’s rule. The military has its own companies that produce consumer products, pharmaceuticals, and manufactured goods. The officer corps also benefit from higher salaries, better housing, and high-quality health care. This is of paramount importance because how the Egyptian army behaves will play a pivotal role in determining the course of the revolt. Secondly, other regimes in the region might become disenchanted if the U.S. fails to back its long-time ally, especially given that a spill-over effect is no longer a probability but a strong possibility. And if large-scale demonstrations spread to Jordan and Saudi Arabia, regional catastrophe would become inevitable. Finally, any sudden change in composition of power in Egypt could potentially empower a popular movement that is less supportive on US foreign policy, thereby endangering U.S. policies such as the blockade of Gaza. However, this is not merely an “Ikhwanophobia”. There are concerns with continuation of U.S. naval access to the Suez Canal as well as the U.S. – Egyptian intelligence cooperation. The U.S. Navy, which sends a dozen of ships through the Suez Canal per month, receives expedited processing for nuclear warships to pass through the Canal, a valued service that can normally take weeks for other foreign navies. Egypt also provides over-flight rights to U.S. aircraft, and it also assembles the “Abrams” M-1 tank at a government facility near Cairo. Egypt is now in possession of some highly advanced American artilleries and that U.S. and its western allies are concerned with the possibility of all that weaponry, or technology behind it, falling into the hands of hostile forces. As such, Washington must get off the fence and publicly explain where it stands. This does not and should not require it to be either with the Egyptian public or against them. At this point, almost any outcome is possible, and thus the U.S. needs to make policy with an eye on its long-term interests. Egypt does not need a revolution but a series of radical reforms. As the Iranian experience illustrates, revolutions are inherently unpredictable and may inspire a hard liner with a well-established constituency to seek power thereby, elevating himself into a position of political authority that he is later reluctant to relinquish. Obviously, Iran and Egypt are different, but revolutions are not. A sudden end to Mubarak’s tenure is highly unlikely to lead to establishment of an inclusive social, economic, and political system. The Obama administration should hence seek to help Mubarak to calm the society without resorting to violent means, freeze its foreign-aid package to Egypt until after elections, refrain from endorsing any particular candidate or party, and use the time span between now and September to help foster civic activities. The Egyptian nation must understand that it needs to do more than rejecting the ways of the past, and try to truly grasp the ideas of liberty and responsible governance if it is serious about democracy. Political actors, in turn, need to define what their strategies are and how they are going to address Egypt’s socio-economic ills so Egyptians can make well-informed decisions on the voting day. This is important, given that current contesters have offered rhetoric as opposed to policy prescriptions, and experience shows that democracy requires more than vague slogans such as “Islam is the solution” or “change is coming”. It is critical that September elections will be held in a free and fair manner and western governments recognize the winner whoever that may be. If the regime tries to cancel, postpone, or rig the elections, this would put an end to any claim the United States has of promoting democracy and reform. As a result, the Obama administration ought to be credited for making it clear to Mubarak that it cannot be business asusual and that it is the retirement time for the 82 year old incumbent. However, foreign governments can do more by encouraging opposition leaders to take part in the government-backed dialogue in order to help defusing the ongoing unrest. After all, creating a pluralistic order will have to entail a measure of goodwill and pragmatism from all parties involved. In the meantime, the U.S. government itself should rethink its grand strategy in the Middle East. The U.S. must reconsider its military aid policy with an eye on linking it to domestic performance of its allies. More importantly though, as recent events in the region illustrate, the U.S. might have to deal with Islamic parties on a more regular basis because they are a part of the region-wide democratic movements and might gain power through elections. Regional political landscape is changing and that Israel’s uncompromising stance on a number of issues is likely to turn it into a strategic burden. This requires the administration to critically evaluate the extent to which its unconditional security commitments towards Israel can negatively affect U.S. flexibility in its regional encounters.